Some lifehacker site a few weeks ago posted a top five list of tools to optimize your life, four of which I have managed so far to live without, and furthermore Brawla Poundstone and I agreed that our lives could hardly be optimal without our heat-safe rubber spatulas (pictured). I talk about all the things I left two of behind in the divorce, but I sure as darn did have the sense to take one of the spatulas. Scrambled eggs are kind of a transitional summer to fall breakfast, for when I'm done with hardboiled eggs but not done yet with fruit for breakfast. 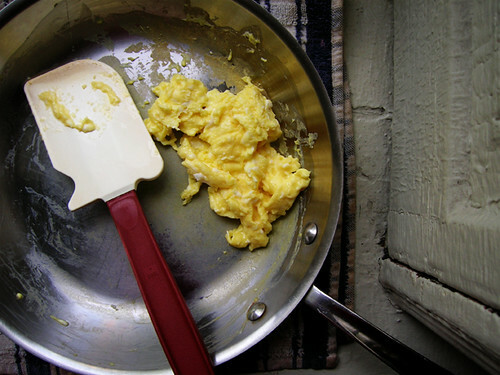 Crack eggs into a small bowl and beat with a fork, and pour the beaten eggs over the butter in the skillet. Now what you do is let the eggs set up a bit and then push them around with the rubber spatula, let them set up and push them around, and so forth, until the eggs are cooked to your liking. I like mine pretty soft but not wet.